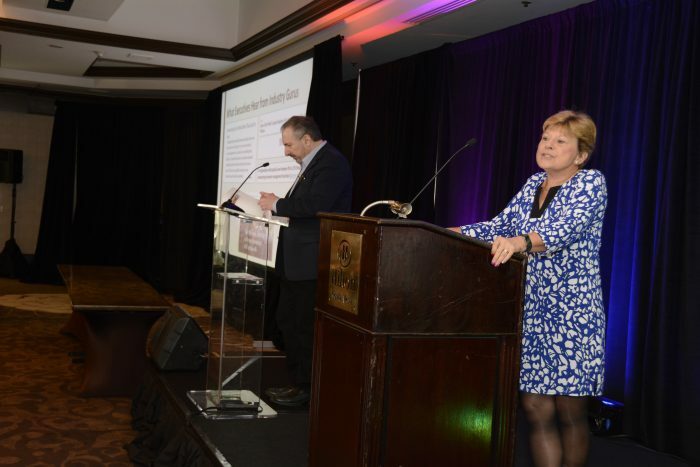 During the IPMA 2018 conference, Howie Fenton and Barb Pellow argued the merits and pitfalls of outsourcing in a riveting session moderated by IPG Editor Bob Neubauer. Howie Fenton and Barb Pellow debate outsourcing at IPMA 2018. If you want more than this synopsis, listen to an IPG podcast of the full debate. You can also watch it on video courtesy of IPMA. 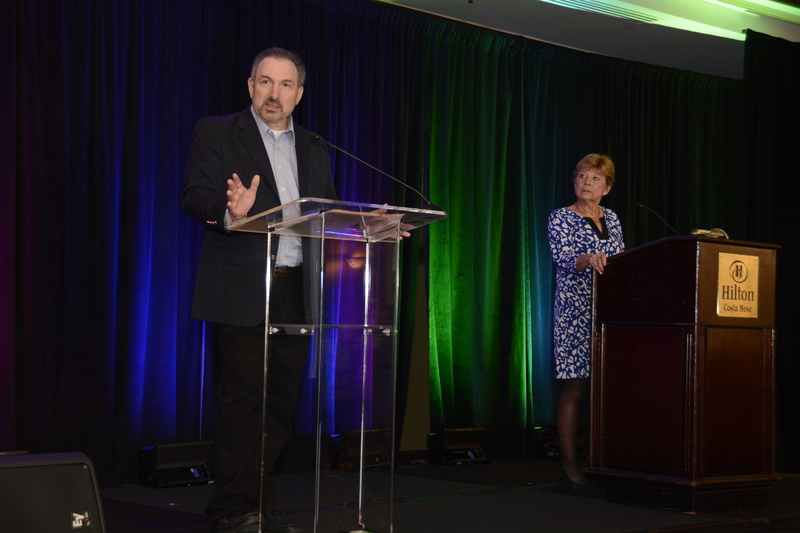 No question, the session that left the biggest impression on attendees of IPMA 2018 was the outsourcing debate that pitted consultants Howie Fenton and Barb Pellow against one another, arguing the merits and pitfalls of outsourcing. While Pellow told the packed auditorium what in-plant managers’ bosses were hearing about outsourcing from business publications and their peers, Fenton countered with examples of broken promises and outsourcing failures, and told attendees how to prepare. Howie Fenton makes a point in the debate while Barb Pellow waits her turn. Those who make such claims, he insisted, are twisting the facts. In reality, the expected best practices, quality and flexibility rarely materialize. One trick outsourcing companies use is to estimate just a portion of your work. Anything that doesn’t fit into that category is an exception, and they’ll charge more for it. Fenton cited a recent consulting job where he counted 279 such exceptions, worth an estimated $488,000/year in additional cost. Pellow then dampened attendees’ rising spirits with the news that outsourcing is expected to grow, citing a study showing that 90% of firms view outsourcing as crucial to their growth strategies. Facilities management (FM) firms tell executives the downsides of in-house printing: volumes are declining, which will make the in-plant’s costs rise; replacing aging equipment is costly; and — by the way — the world is moving to digital communications. “That in-plant could be an impediment to you making that digital transition,” she said, paraphrasing the FMs. They will say they can offer companies a reduced cost for print and delivery, she noted, give them access to new technology, help them accelerate the digital transition and let them focus on their core business. Taking a breath, Fenton challenged these challenges, saying they betrayed a “fundamental misunderstanding” of the way print and mail operations are run. To “prove” the in-plant’s inefficiency, the FMs will set unrealistic goals, he said, like insisting they must achieve 80% utilization on their equipment or they are losing money. “No company I’ve ever been in has achieved 80% utilization on their equipment,” he observed. Barb Pellow tells attendees what their bosses are hearing about outsourcing. The FM, he added, is promising to use that same equipment, same staff and same electricity, yet sell the work for 20% less. “How can they do that?” he asked, incredulously. The only way, he answered, is by paying those people a lot less. The way you defend yourself, he told managers, is by using metrics and reporting your benefits and savings to upper management. Otherwise they will only hear the pro-outsourcing side. “Be prepared to defend the in-plant even though you might never need to,” he encouraged. Still, Pellow delivered a litany of benefits that outsourcing companies list for curious company executives: Outsourcing gives you access to a larger talent pool than you can find in your limited local market; you’ll have less overhead and lower real estate costs since some printing can be done offsite; you’ll have less risk, access to the best technology and 24/7 service through the use of the FM’s other print facilities. And they very often will have a receptive ear in an executive that has seen outsourcing work at other companies. “You’ve got a senior executive staff that has experience … with outsourcing everything from food services to some portion of IT, and you just happen to be next on the list,” she remarked. “The theory is that it’s going to save money, reduce risk, increase flexibility, help you reengineer, turn around things faster, give you a better competitive edge. That’s the theory,” he snorted. “Show me a book that says that the best companies in the world are the companies that succeed because of their outsourcing. There are none. There is absolutely no evidence, looking back at successful companies, that outsourcing is one of the reasons why they are successful. Pro-outsourcing arguments are theoretical benefits looking forward, he concluded, but in-plants have evidence of past success to point to. Pellow briefly countered one of Fenton’s assertions by citing a Bain & Co. study that reported the fastest growing companies have outsourced non-strategic services, but Fenton said those were IT services, restaurants or the truck fleet, not printing. Pellow concluded by talking about how the outsourcing discussion often gets started. She listed some buzz words to pay attention to. If management says a consulting team is coming in to help with a “business transformation strategy,” beware. Other troublesome terms: business process outsourcing, customer communication management, enhancing digital services, user experience transformation or operations transformation. Fenton ended with question designed to spur action. The in-plant is losing money or prices are too high. Print and mail are not company core competencies. Printing is not strategically aligned with the company mission. “Take the time to build the metrics and reporting structure,” Fenton advised. Once this is done, it will support the in-plant for a long time. The debate ended (all too quickly) on a positive note with a list of 10 ways in-plants can avoid the outsourcing discussion. Drive ideas to improve business results for your organization. Educate management on how you are saving the organization money. Understand your costs, and communicate the impact you have on saving the organization money. Compare prices with outside printers regularly with periodic reports to upper management. Deliver high-value services to your user base. Market and promote your in-plant. Leverage your expertise to manage print outsourcing and copier fleets. Deliver innovative new products and services. Build an insourcing strategy to drive revenue. Have clear justification for any capital acquisition. Survey your user departments regularly. The debate covered many other areas and included great advice. To hear the session in its entirety, listen to the podcast on the IPG website. You can also watch a video of the 60-minute session on the IPMA website.